Which islands and cruise ports are open for business in the Caribbean post Irma and Maria? My Vacation Lady has clients vacationing and cruising the Caribbean all year long and the back to back hurricanes (Irma and Maria) caused a lot of concern for our clients. We’ve had to move some of our clients who were planning vacations in the effected islands and we’ve been receiving calls from our cruisers about which islands they would be visiting. 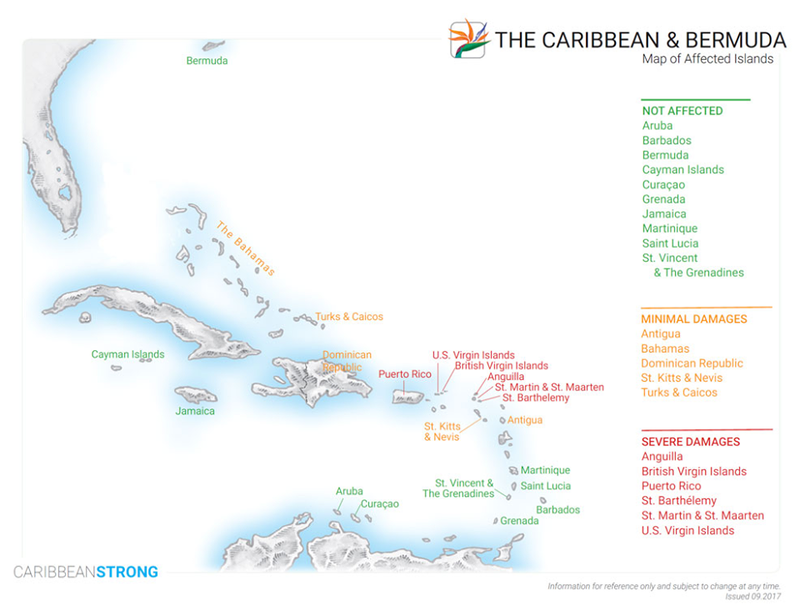 One of our suppliers provided us with a good map of the how the islands of the Caribbean fared after Irma and Maria. When it comes to hurricane paths, there really isn’t any good reason why one island was devastated but the island right next to it managed to escape the wrath of these 2 storms. As you can see from the picture above, The islands most effected and in the most need of assistance in rebuilding are Puerto Rico, the US and British Virgin Islands, St Martin, Anguilla and St Barths. Barbuda (which is not a tourist destination) was devastated but its sister island, Antigua, had minimal damage. According to an article posted in Insider Travel Report, a travel trade online magazine, of the 48 Caribbean cruise ports, most were not effected at all. For example, in places such as Jamaica, Belize and Cozumel in the Western Caribbean, and Aruba, Bonaire and Curacao in the Southern Caribbean, and Antigua and St. Kitts in the Eastern Caribbean, it’s business as usual. Ports in the Bahamas, including Nassau and the private islands …, are also open for business, providing cruise passengers a fun beach experience. Cruise lines, given that their ships are mobile, were able to update itineraries where needed before, during and after the storms. Most cruise itineraries in the Caribbean are unchanged. Ports not fully operational are quickly rebuilding, with St. Thomas, St. Maarten, Grand Turk, Dominica, Puerto Rico and St. Croix all vowing to be back on line soon. My Vacation Lady receives frequent updates on the status of resorts and cruise ports and we are updated out clients as word comes out. So far, Some of our clients cruising in the next few weeks are visiting Punta Cana, Dominican Republic instead of San Juan and the private Bahamas Islands instead of Turks and Caicos. For our clients traveling in 2018, we will send word out on any itinerary changes as we receive them. Tourism is the major business of many of the Caribbean nations. Please realize that most of the islands were not effected and it’s business as usual. Resorts are re-opening as we speak. Your vacation will still be wonderful- but will perhaps new trees vs. lush tropical foliage. The Caribbean is open for visitors. My Vacation Lady can help plan your vacation, honeymoon or cruise to the Caribbean and the rest of the world. By Mindy Gilbert|October 20th, 2017|Categories: All|Tags: Caribbean cruise ports effected by the hurricanes, Caribbean destinations out of the hurricane zone, Caribbean Honeymoon, Caribbean Honeymoon Planning, Caribbean islands, Caribbean vacations, cruise ports open in the Caribbean, cruise ports post Maria, Cruising the Caribbean|Comments Off on Which islands and cruise ports are open for business in the Caribbean post Irma and Maria?